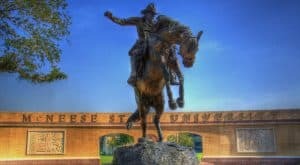 The 11th Annual Cowboy Camp at McNeese State University will be held Friday and Saturday, Aug. 17-18, to give the incoming freshman class and transfer students the opportunity to learn about the traditions and history of McNeese before the fall semester begins. “Cowboy Camp is a two-¬day program specifically designed to help students get connected to McNeese, learn to become a leader and meet people in their incoming class that are motivated to be engaged on campus,” said Kedrick Nicholas, director of campus life, engagement and student retention. Participants can also move into their campus housing before other residents and participate in group competitions and exclusive tours. The cost is $55 for early registration (through May 31), $60 for regular registration (June 1- July 31) and $70 for late registration (beginning Aug. 1). This includes the two-¬day Cowboy Camp experience, four meals, two T-shirts and entry into drawings for McNeese gear, scholarships and cash prizes. For more information about Cowboy Camp, contact the Student Union and Activities Office at 337-¬475¬-5609. To register, go online at www.mcneese.edu/studentlife/cowboycamp. Persons needing accommodations as provided by the Americans with Disabilities Act should contact the ADA Coordinator at 337-¬475-¬5428, voice; 337-¬475-¬5960, fax; 337-¬562-¬4227, TDD/TTY, hearing impaired; or by email at cdo@mcneese.edu.